The Londonist Literary List appears every Tuesday. If you’d like to bring an event to our attention, please email londonistlit@gmail.com. The Oxford Literary Festival continues through tomorrow (the 29th), with such preeminent writers as Doris Lessing, Alexander Waugh (Evelyn's grandson), James Fenton, Max Hastings, and Joanna Trollope still to appear. Venues and prices vary. See website for details and ticket information. Tonight, authors Ismail Kadare and Harry Mulisch appear together in the final event of the "Stop the Clock: Writers and the Perception of Time" series. They will each be discussing their respective most recent novels. 7:45pm. South Bank Centre. £8.50. Also tonight, The Gate Theatre presents a retrospective of Nobel Prize winner Harold Pinter. All proceeds go to Writers in Prison, an organization set up to defend threatened critical voices around the world. 7:30pm. 11 Pembridge Road. £25. 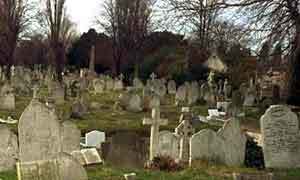 On Wednesday (the 29th), the Ambit Lit Journal is hosting a reading at the Dissenters' Chapel inn Kensal Green Cemetery (pictured), against the backdrop of an exhibit by artists Orly Orbach and Sarah Bevan. Attend only if you are not afraid of the dark. 7:30pm. Kensal Green Cemetery, Ladbroke Grove. £4/£3 concessions. On Thursday (the 30th), Book Slam returns to Cherry Jam with author Donna Daley-Clarke and a few musicians and songwriters. 8pm-ish. 58 Porchester Road. £2 before 8pm, £5 after. On Friday (the 31st), the Artistic Director of Shakespeare's Globe, Dominic Dromgoole, discusses his new book, Will & Me: How Shakespeare Took Over My Life, in the basement space of the theatre itself. 6:30pm. Underglobe, The Globe Theatre, 21 New Globe Walk. £5.